(Bloomberg) -- Central banks bought more bullion last year than anytime since 1971, when the U.S. ended the gold standard. Governments added 651.5 tons of gold to their coffers in 2018, a 74 percent increase from the previous year, according to a report from the World Gold Council. Russia, which is "de-dollarizing" its reserves, was the biggest buyer, followed by Turkey and Kazakhstan. Hungary also made a large purchase, citing gold’s lack of counterparty risk and role as a hedge against changes in the international finance system, the WGC said. “Central banks chose to significantly increase their gold reserves, reinforcing the importance of gold as a reserve asset,” the WGC said. Central banks are expected to acquire an additional 600 tons this year, according to the consulting firm Metals Focus Ltd. 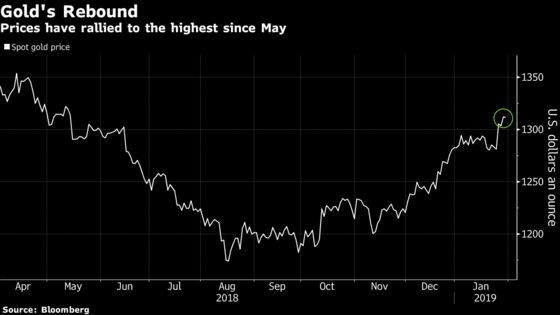 The buys, which will help the banks diversify their foreign-exchange assets in a time of extraordinary political volatility, signal a growing confidence in the metal’s value moving forward. The banks "were not net buyers even a decade ago," said Juan Carlos Artigas, director of investment research at the WGC, in a telephone interview. "As their foreign reserves expand, they are increasingly diversifying away from pure dollar exposure." Slowing global growth, a weaker U.S. dollar and a drive by central banks to expand the amount of gold they hold could be a winning trifecta for investors seeking a recovery in the metal’s price after its first annual loss in three years. Gold prices ended 2018 little changed, but rallied toward the end of the year amid concerns about Brexit, a falling stock market and expectations for a less aggressive U.S. monetary policy. The trend has continued this month, with bullion climbing to the highest since May. Bar and coin demand rose 4% to 1,090.2 tons, with coin purchases at a five-year high. Global ETF inflows fell 67%, but were up for the year in Europe. Jewelry demand was steady, and total supply was little changed.